A look at open source cellular progress over the past six years and more recent developments which suggest that a bright future lays ahead. Six years ago today The H – Open published an article I wrote entitled, Building a GSM network with open source. In this I covered in brief the development of two crucial early software stacks: OpenBTS and OpenBSC. The former built upon an SDR transceiver, dispensing with traditional GSM architecture and transitioning to IP as soon as possible — while the latter started out making use of existing commercial BTS equipment, before progressing to custom hardware. Over the years those two stacks have both made great progress and, as is so often the case in open source, benefited from the existence of each other: the L1 transceiver code from OpenBTS was forked to provide an SDR PHY for OpenBSC-based architectures; the resulting OsmoTRX codebase features numerous improvements and can be used as the transceiver for OpenBTS. In addition both OpenBTS and OpenBSC — or perhaps more accurately, Osmocom, the umbrella project and community for OpenBSC plus related open source mobile communications projects — have 3G solutions, which once again take different approaches. The OpenBSC/Osmocom stack has also been decomposed into an architecture which is much closer to what you might find in large-scale production networks, with a far greater degree of modularity and in turn flexibility. Operating under the auspices of the Telecom Infra Project (TIP) initiative led by Facebook we now have OpenCellular, which aims to improve connectivity in remote areas of the world. This builds on the Osmocom GSM stack and, amongst other things, adds a Community Cellular Manager for software management and deployment in small scale cellular networks. The OpenAirInterface Software Alliance (OSA) grew out of the work of EURECOM and are meanwhile focused on the development of a software-defined 5G system, with a 4G eNodeB and EPC already available and which support use with low cost hardware. Of course, it would be remiss of me not to mention Myriad-RF — an open source initiative that we’ve been closely involved with and which has set out to democratise wireless innovation. Established before both TIP and OSA, and not long after publication of the aforementioned article, Myriad-RF has grown over the years from a focus on adding highly flexible RF to digital designs, to a vibrant community engaged in not just original hardware design, but also developing applications for radio access networks, GNSS and even radio astronomy, to name but a few. 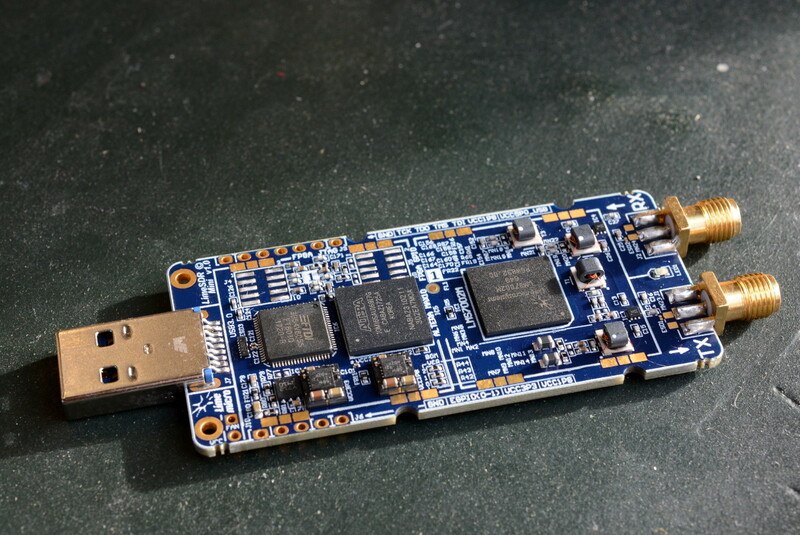 LimeSDR is set up as a project under Myriad-RF and is a family of flexible, next-generation, open source SDR transceivers, ranging from the incredibly compact LimeSDR Mini (10MHz-3.8GHZ SISO), right up to the LimeSDR-QPCIe (10kHz – 3.8GHz 4×4 MIMO + adaptive digital pre-distortion), plus the LMS8001 Companion that extends their frequency range up to 10GHz. LimeNET goes further and builds upon the LimeSDR platform to provide pre-integrated, qualified reference hardware that is suited to use both in R&D labs and network deployment. Benefiting from an app store delivery model built around the Ubuntu snappy platform, with features including application containerisation and transactional updates. In addition to the hardware itself and the fact it’s now possible to get a wideband, full duplex SDR for under $150 — or indeed for less than $3,000 a 4×4 MIMO SDR with integrated GPSDO and supported by a fully open source ADPD implementation — what is particularly exciting is the industry support that these platforms have garnered, with BT/EE, Vodafone and more recently ESA having put significant backing behind crowdfunding campaigns launched to make them a reality. Much as in the enterprise we have a mixture of fully open stacks, proprietary workloads running on open source infrastructure, and open source apps running on proprietary platforms, we are starting to see the same in cellular networks. And while this post is primarily concerned with open source technologies, proprietary solutions which are relatively low cost and, importantly, may be used with commodity hardware, also have a key part to play. Examples of which include the Quortus Pocket EPC and Amarisoft eNodeB, both of which are qualified on LimeNET hardware. Getting back to open source, we’ve also seen the development of srsLTE, which includes a complete LTE UE and eNodeB, plus a lightweight EPC, in addition to providing the foundations for tools such as the imdeaOWL LTE control channel decoder. More recently we’ve also seen Radisys announce the open sourcing of their 4G RAN Software for the Qualcomm FSM9955 Chipset. A special thank you must go to the Osmocom community and core contributors, sysmocom, who sponsor much of the development of a software stack which has demonstrated that, as exquisitely arcane as it may seem to the uninitiated, cellular infrastructure is very much within the reach of open source development projects — and a software stack which also serves as a fantastic exemplar and one which we expect will play an important role in the future of cellular networks. Industry adoption of Linux didn’t happen overnight and although first released in 1991, it took a number of years to build up a community of dedicated contributors and enthusiasts. Following which we had the enterprise early adopters and it wasn’t until the late 1990s and early 2000s that we started to see real industry traction. During those days there were no shortage of detractors, most of which vendors of proprietary incumbent UNIX platforms that were pushed aside some time ago. The setting now is quite different of course and on the whole the benefits of open source are well understood. Although the challenge of creating low cost, open source wireless infrastructure platforms does to some extent combine those of “creating the PC” — or commodity RF in this case — and the software stacks to drive it. Thanks to Lime Micro with the development of LimeSDR and LimeNET we now have this, and with BT/EE, Vodafone, ESA and others having recognised the scale of the opportunity and providing their support, development will now continue apace. Top image: an OpenBSC/Osmocom powered sysmoBTS “network-in-the-box” as featured in follow-up article for The H – Open, The open GSM future arrives: Hands on with the sysmoBTS (note the articles are not currently displaying images).